At SafeDate, we think dating should be a fun and safe experience. 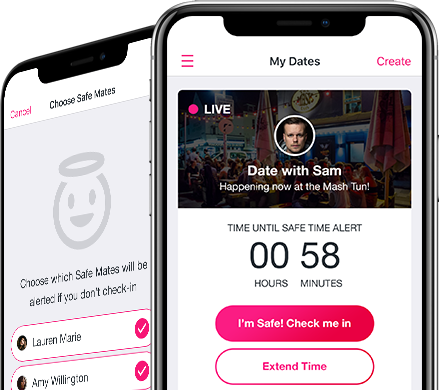 We created SafeDate to offer peace of mind to you and the people close to you, so we’re on a mission to keep people connected in a safe, yet private way. Now you can enjoy dating with the comfort of knowing that your close ones have got your back. Emma is one of the UK’s most influential female entrepreneurs. She has made her name launching her global events company in 2005, which now has over 100,000 members having launched events across the US, Australia and Europe. Hadleigh is an investor, entrepreneur and CEO of Colab Ventures. He has an award-winning background in digital media, which has spanned across multiple industries, working with companies such as Swift Social, Bidstack and Nutrifix. As CEO and Co-Founder of Swift Social, Arni has over 15 years of experience in visual design. He provides strong vision for new user experiences, with relentless customer focus and high business discipline around execution.